Life of Dora Dori: Sian Vivy Yusof : To don or not to don? I must admit that I am an avid reader of Vivy Yusof’s blog which you can read it here. She and her fiancé are the founder of FashionValet (FV) that has become prominent in virtual world of online shopping. I haven’t bought anything from her (yet) as the clothing line is beyond my stipulated budget but do check it out. Adore them but cannot afford la pulak…. More often than not, Vivy would blog about her daily life, work, family and she is a walking advertisement of FV. But bare in mind that she is considered petite hereinafter all her attires look dapper and tailored. She even claimed she is vertically challenged. Funny… In this regard, do check the sizes properly prior to purchase especially if you’re tall.. Some of her attire looks very appealing but not suitable for my height (tak laaa tinggi sgt pon… 168cm jer) especially when my guideline is not to flaunt & accentuate my figure. 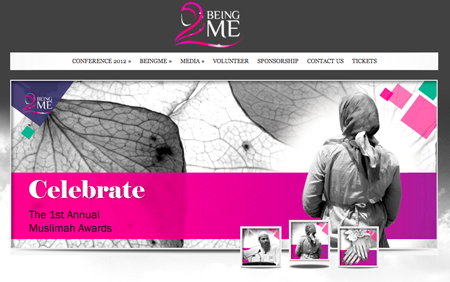 Recently Vivy posted an Islamic conference namely as Being Me. Do get more info from vivy’s blog but apparently based upon her experience, this Islamic conference is more imminent and not patronizing. In fact, according to her (from what I decipher) the sermon is more subtle and easier to embrace. The conference also welcomes non-Muslims and meant for women only. Sounds very innocent right? So what is the big-a-deal about it? Apparently one viewer posted a comment on this matter that Vivy Yusof; a free hair stylista does not have the credibility to promote such an event due to her flaunty attire…….. She even had the impertinence to say Islamic sermons should be FOC and questioned the reasoning behind inviting non-Muslims..You know what she said to Vivy? Consequently many of Vivy’s loyal readers were triggered and this is where suddenly the focal point of the entry was misled. The pure and innocent caprice of inviting women to the conference was tarnished by this brash comment and people were more interested in debating and defending one-self. I notice that there are two school of thoughts; the Non-Hijabista (NH) keep defending their siege of mentality saying that they are not ready, they need time, have not found the hidayah etc etc etc… Some did sound sincere and sober when they simply explained that upon covering the head, it must be synonymous with covering everything else too. They emphasize that everything has its own good time. On the contrary the Veil Ladies (VL) responded covering is a must and these people are just justifying their sins to camouflage the real agenda; I DON’T WANT TO WEAR IT. The reason I’m posting this entry because I find this topic is very close to me. I was born and breed in Shah Alam; a city that most people perceive as not-so-pious due to our modern lifestyle and neighboring KL; a vicinity surrounded by night clubs. My upbringing was mediocre and mild; I wore tudung occasionally, I adhere to 2/5 or 3/5 prayer time (yea, dulu aku byk tinggal solat… and I’m not proud of it) but I have never enter any nightclubs in my entire life. NEVER. My attire was also descent as my parents would scold me if I show too much skin. Hence, I do understand these ‘stubborn’ girls. It is a very big move and difficult for us to migrate and begin covering. Your vicinity may be surrounded by people with veils but do they wore it appropriately? I don’t think so. People do don the veil but what’s the deal with wearing them with skimpy jeans, legging, sleeves above their elbow, baju kurung tailored to accentuate their figure and the worst part revealing their chest? So what’s that about? The NH does have a point; upon covering, one must cover everything else to comprehend the veil. Like for me, when I started to have the notion to wear tudung, I started by changing my wardrobe slowly and collecting tudung that suits me. As a result, I felt more calm, serene and complete when I wear my veil in the correct manner.I felt proper. I have always look upon VL because the society has the notion where VL is kind hearted, speak of kind words and an epitome of Muslim women. Don’t you think it is obfuscation when you stumble upon a VL with a tainted heart? Ranting mean words, doing obscene things, wearing inappropriate attire… Furthermore, can you vouch that every NH is bad and every VL is good? Putting on a veil while rebelling inside drives a person to doth sinful acts as they have not receive the hidayah. If all VL have received the hidayah from Allah SWT, you won’t see any VL in the newspaper caught in shame. Please be realistic. Wearing tudung / hijab / veil is a MUST / COMPULSORY OBLIGATION for Muslims. By not wearing them, you are actually dragging your husband / father / brother closer to hell. I won’t argue with that. But do bear in mind; Allah SWT is Great and Kind. Do give the NH some time for them to embrace the thought and repent in their own good time. We are not given the credibility to place any verdict. Instead, try our very best to attract them and let them see the beauty that Allah SWT has promised upon wearing them. *Memang laaa pelik bila org yg seksi tak bertudung ajak pergi dgr ceramah agama..... TAPI… bukankah itu juga tanda yg die berminat untuk menghayati Islam tetapi barangkali memerlukan lebih bimbingan dan sokongan? Sian die tau... X baik menilai die sesuka hati.. She has improved her style by becoming more decent.. Some thoughts to ponder on Friday…All the best Vivy.. I found this from Suhaib Webb's blog which is deemed fit for this issue "Hijab is to Not to Protect Men, But to Honor Women"
For sisters, if you want to advise someone about hijab, ask yourself, am I advising because it makes me feel pious? Or am I advising because I care about this person and want to be a good friend and sister in calling her towards the pleasure of Allah (swt)? Most of the sisters who decide to wear the hijab in adulthood don’t do it because someone yelled at them or taunted them. They do it because they were able to recognize its beauty after spending time with people who wore it with dignity and showed modesty not just in their clothing, but also in their character. SEEK TO UNDERSTAND & BE UNDERSTOOD.. I agree. I don't understand why Malaysians like to criticize someone based on the way they dress. What's the point in covering up or follow traditional Muslim attire, but so hostile and mean about a fellow sister in Islam? Such a shame to see people like this.. I think it's a good thing Vivy encourages her readers to go to these talks because she does feel that there's a true benefit in going. Well, the reason being is some women wear the veil due to their upbringing w/o proper understanding of the notion. I surmised that Vivy must had good intention in her heart regardless of her view pertaining to hijab. I'm just saying give the little girl some break. Just because she is not ready to cover doesn't mean she is a horrible person.. As another sister in Islam, I do pray that she will embrace the veil soon. For instance a prominent public figure in Malaysia is Wardina Safiyyah. She was a model cladding in mini dress prior to wearing a full garb. And look where she is standing today; a true inspiration on proper hijab attire that we can make an exemplar of. Owh..dat's huge... i guess it's ok laa kot... just bare in mind the focal point of this entry was simply about asking people to understand those who are not ready to cover up & we should be kind in guiding them towards embracing the hijab..
yeaaaaaaaaap! i concur with you.. In my frank opinion, there is nothing wrong for others to listen to Islamic sermon. For instance, when i attended the Being Me event, i noticed there was a tall and lanky girl who didnt cover her head in the hall. She was the only girl who didnt wear a veil but her attire was reasonable. Until i noticed that she was actually Chinese. I would definitely give her a standing ovation for the courage & patience in listening to our religion. But for us to listen to other's sermon, it requires strong faith. Iman. thanx for your thought dear. This post is lovely and empowering! I face the same dilemma of wearing the hijab (as a convert) and doing it right. It's not easy to adjust. And the critiques and their perfect opinions of this is a drag either. I have a blog too, do drop by when possible.